One of the most complicated to understand of the attributes traditionally used by the classical and medieval tradition of God is his “simplicity”, or non-compositeness. I remember when I first read someone say that God is “simple” I immediately balked thinking to myself “What nonsense. How could the Christian God be simple? He’s so utterly beyond us, that there’s nothing ‘simple’ about him. I mean, God is the Trinity, for crying out loud!” Of course, like most I was confused as to what the traditional theologians of the Church had actually been claiming when it came to the doctrine of simplicity, and so, like many contemporary theologians, especially the revisionist ones I was reading at the time, I rejected it as philosophical nonsense. However, since then I’ve come around to thinking that some form of it probably ought to be retained. Some of you may even right now be thinking, “Well, that’s nice for you, but I’m still in the dark about it, so what is it?” Well, that’s where things get tricky. You see, even among theologians who currently affirm it, there’s some debate as to what the doctrine of simplicity actually holds. At it’s most simple–see what I did there, eh?–the doctrine teaches that God is not made up of any parts or components. He is simple in that he is not “composite”–you can’t pull him apart and then put him back together. Still, based on the way a theologian comes to hold simplicity, whether through biblical arguments, philosophical reasoning of various sorts, etc. they tend to end up offering different formulations of the teaching, some of which tend to generate more questions or objections than others, which can tend to make things difficult to evaluate. So, for instance, some will say it only means God isn’t composite–God isn’t part love and part holy, with the possibility that you could separate out the bits. Or, it isn’t that case that his love part wins sometimes and his holiness at others, but that he is always fully holy and loving in all that he does. Others, though, will go further and say that means that God’s holiness and his love simply are the same thing and that the only distinctions there are between the two are conceptual ones related to our minds. Still others will take it even further than that. The result is that one argument seems to be quite persuasive against one formulation, yet tends to have very little effect on another more modest one. As with immutability, so with simplicity we may consider whether God is simple in all respects, in some respects or in no respects. Any purported defense of simplicity will conclude that God is simple in at least some respects, so we will ignore the last option. Now obviously God is not simple in just any sense. One meaning of “simple,” after all is “unintelligent.” It should then become clear that there are several crucial senses in which we should say that God is simple and a few sense in which we should deny it. All divine properties are possessed by the same self-identical God. God is not composite, in the sense that he is made up of elements or properties more fundamental than he is. He has no external cause(s) such as Platonic form. All of God’s essential properties are coextensive. All God’s perfections are identical. All God’s properties are coextensive. 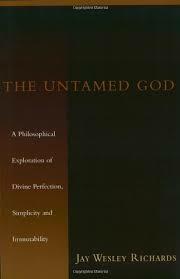 God’s essential properties and essence are (strictly) identical with God himself. All God’s properties are (strictly) identical with God himself. Of these, 1 is the easiest to accommodate;it 8 is the most difficult. In fact, of these eight possibilities, we can defend plausible renderings of 1, 2, 3, 4, and perhaps 5. But it should become clear that the Christian must deny senses 6, 7, and 8, at least on certain contemporary interpretations…Interestingly, there seems to be an asymmetrical entailment relations between these theses going from 8 to 1. So, for instance, 8 entails 7, but 7 does not entail 8, and so on. If this is correct, then 8 is clearly the strongest form of simplicity and 1 is the weakest. We should not mistake the strongest version of the doctrine, however, with the most traditional. It may be that the strongest versions of the doctrine have resulted from misinterpreting certain traditional claims. In fact, I suspect that sense 2 is the primary burden of the traditional doctrine, rightly interpreted. So, there you have it–clear as mud, right? But honestly, this little breakdown before he moves on to his defense of a modest version of the doctrine is very helpful in distinguishing the various different types of simplicity that are often forwarded in theological discussion. While not all readers will want to follow his distinctions between essential and contingent properties (Richards distinguishes between properties God has essentially, apart from all relations, and those which he has in light of having freely created and related himself to a world), you can see that it’s not just a simple matter of accepting or rejecting the doctrine. Some will hesitate about the more strict forms but have less issues with the more modest forms. What’s more, as Richards points out, it’s not necessarily the case that accepting the more modest forms while rejecting the stronger forms is a “revisionist” take as it seems that the initial few senses may even be the most traditional senses. As for myself, I’d say I currently do affirm it probably at least the first 5 senses. The rest are still up for grabs until I do a little more digging. For those looking to dig deeper into the issue, Gavin Ortlund has this excellent little introductory post on it. For those looking for interesting modern discussion with an emphasis on the practical importance of the doctrine, there’s a great one in Tom McCall’s great little book Forsaken. For a traditional discussion, I’d also highly recommend Herman Bavinck’s Reformed Dogmatics Volume 2 on the Doctrine of God. Finally, though I haven’t read it yet, James Dolezal’s God Without Parts is supposed to be one of the best, robust, modern articulations to date. David Bentley Hart has a good, though brief, exposition of the doctrine of divine simplicity in his new book you’d find interesting. There are a lot of careful distinctions and nuances that need to be made here, though – absolute divine simplicity leads to necessaritianism in God, which isn’t really somewhere I want to be, personally. Yes, that is one of the various criticisms that has weight for me and currently keeps me from affirming the stronger forms. I’m morr attached to aseity than simplicity. Well, everyone probably affirms *some* kind of simplicity – very few people actually think God is made up of parts (though Hart notes that there is a trend in analytic theology to deny simplicity. I disagree that such a denial leads to atheism, though. He doesn’t name names, but I’m guessing he’s referring to William Lane Craig, Plantinga, and Wolterstorff). Not too take this comment too far afield from your OP – but one’s conception of what exactly the experience of salvation is also has some significant bearing on discussions like these. I myself side with the Orthodox that salvation is theosis/participation, so the energy/essence distinction is pretty important here. Conceptions of simplicity that negate or preclude real, actual communion with the divine as the experience of salvation is where it starts to get problematic, for me anyways. I can vouch for God without Parts; it’s amazing. Aquinas on Simplicity by Peter Weigel is also very good. And Stephen R Holmes has a good article on the subject (it’s reprinted in his collection Listening to the Past).